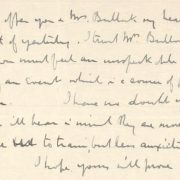 Letters between Frederick Smith and Fred Bullock, Secretary of the Royal College of Veterinary Surgeons [RCVS]. 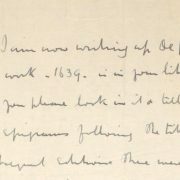 The main subject of discussion is research carried out by Smith, with Bullock’s assistance, regarding manuscript and literary sources of veterinary history and biography from the seventeenth, eighteenth and nineteenth centuries. 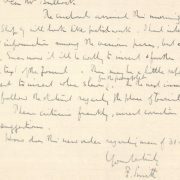 At this time, a series of articles by Smith titled ‘Early History of Veterinary Literature’ were being regularly published in ‘Journal of Comparative Pathology and Therapeutics’. 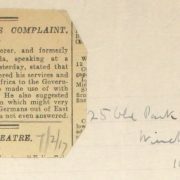 Particular topics discussed include: the works of Leonard Mascall and Gervase Markham; translations of historical documents; the library at the RCVS, the British Museum and Public Record Office; photographing documents to include in Smith’s publications; editing proofs of Smith’s articles; the World War [1914-1918], and Bullock’s appeal for exemption; and personal matters including the birth of Bullock’s son Wilfred and Smith donating books and notes to the RCVS. 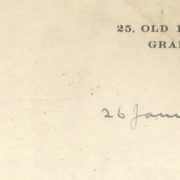 Smith writes regarding the works of Grosart[?] 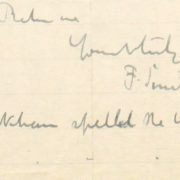 and Markham at the Company of Stationers[?]. 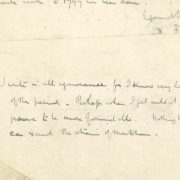 He also gives a list of books he is offering to the Library of the Royal College of Veterinary Surgeons. 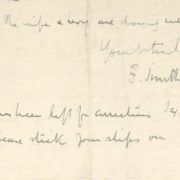 Smith writes to congratulate Bullock on the birth of his son [Wilfred], and compares the difficulties of raising boys and girls. 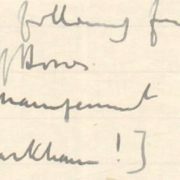 Smith writes regarding the sending of books and apparatus to the Royal College of Veterinary Surgeons Library, and asks Bullock to compare Heusinger and Fleming’s ‘Animal Plagues’….